If you’re interested in lending a hand for the cycling community, we need volunteers for a couple of events next week. Helpers are needed for the Timpanogos Gran Fondo on June 29th, and we’re looking for some additional volunteers to help out at aid stations and along the course on race-day. If you’re interested, the organizers are happy to give all the volunteers one of their race shirts, a guaranteed spot in next year’s race, and a $10 discount for next year’s event. We know it’s last minute, but please sign up by this weekend and let them know that you’re with the BikeProvo.org when you sign up (it will appear as an option). Bike Rodeo volunteers are needed throughout the summer to help guide obstacle courses, fix flat tires, etc. At the moment, volunteers are needed for the evenings of June 26th and June 27th. 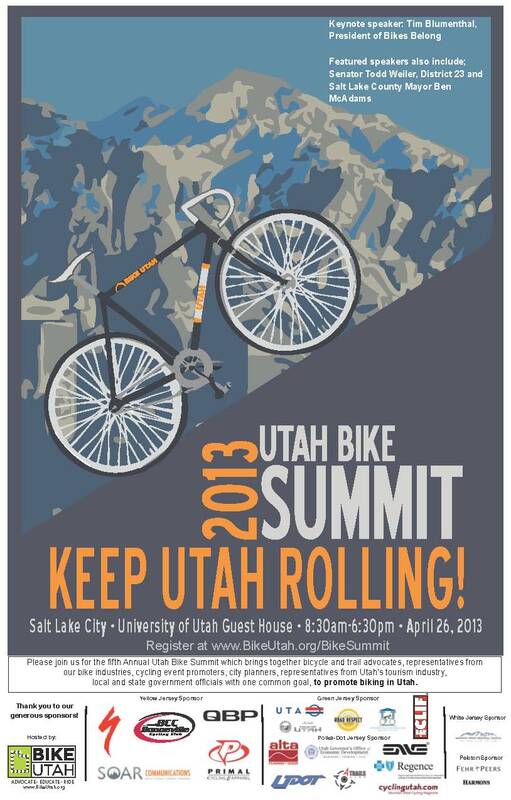 Email bikeprovo (at) gmail (dot) com to volunteer and get more info. Thanks for your willingness to help our city become more bike friendly! Because there is serious support from top state politicians and officials. This year program participants included no less than the state senate president, Wayne Neiderhauser, a fellow senator, Todd Weiler, Salt Lake County Mayor Ben McAdams, Ogden City Mayor Mike Caldwell, and then several top administrators of UDOT, UTA, WFRC (Wasatch Front Regional Council representing the Salt Lake-Davis counties), and MAG (Mountainland Association of Governments representing Utah County). All the politicians were avid cyclists of one sort or another and the bureaucrats were uniformly enthusiastic about bicycling. As a result, positive developments are accelerating. 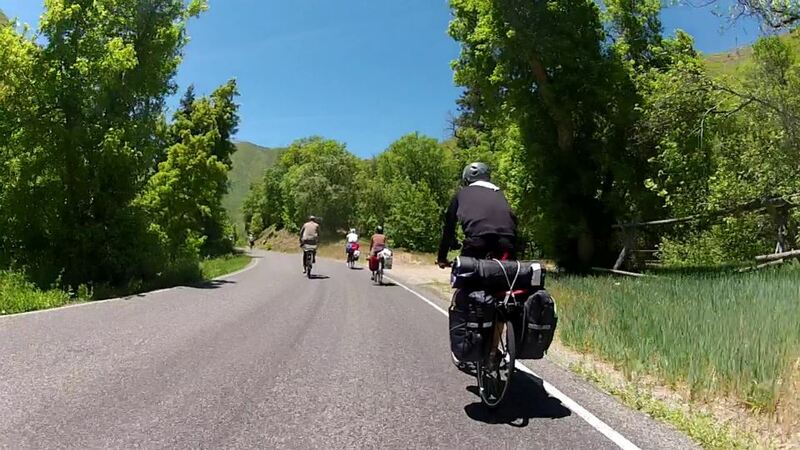 For example, Weiler, who began commuting from Woods Cross to downtown SLC by bike four years ago and has survived four accidents with automobiles (one of which should have probably killed him), successfully shepherded State Bill 104 through the legislature. Caldwell, a hard-core roadie, had just returned from a trade mission to Taipei to court Taiwanese companies to set up shop in Ogden and add to the over 2000 jobs outdoors-related jobs in the city. In short, it makes a difference for bicycling that top leaders like to bike. Because of the emergence of a new paradigm. “Active Transportation” was a term that I did not hear once at last year’s gathering but was touted again and again at this year’s summit. Active transportation is forms of commuting like bicycling that provide people the opportunity to move their bodies rather than just sit. Top UTA official Michael Allegra bragged that its buses and trains had carried over 1 million bicycles last year, and that its buses will soon carry 3 rather than just 2 bicycles on the front of buses. SLC representatives rejoiced that in 2013, what Mayor Ralph Becker dubbed the “Year of the Bike,” bicycle mode share has reached 4.6%, seen a 30% increase over the last 2 years, bicycle corrals are spreading thanks to requests from businesses, and its bike-share program is off to a superb start. Because Tim Blumenthal said so. Blumental, a longtime bike advocate and the president of Bikes Belong, delivered an upbeat but thoughtful keynote address. He discussed the current strengths, weaknesses, and opportunities for bicyclists. The strengths of bicycling now are: it is popular (about 50 million or 1/5 of adults ride bicycles), it is a part of the solution to lots of problems (including foul air), it is supported by almost every big-city mayor, it is growing (especially for short trips in big cities), and it boosts business. The most serious weakness is that riders usually face sub-par bicycling conditions. In Blumenthal’s estimation, about 60% of people are what he calls “interested but concerned.” They are not like the small minority who will ride regardless of the conditions. Because they do not see bicycling as safe, they are not willing to ride. These are the people who should be our focus. Other weaknesses include tight transportation budgets, distracted drivers, and bike riders who often unpredictable. Getting the “interested but concerned” to ride is one of Blumenthal’s top priorities and to do that he advocated what he calls “green lanes” and what SLC calls “cycle tracks,” bicycle lanes that are separated and protected. He also encourage us to slow down neighborhood traffic (to 25 mph), encourage more kids to ride, argue that bicycling is a cost-effective infrastructure investment, and quantify the benefits of bicycling. We are taking advantage of these positive developments in Provo and our success was mentioned several times by summit participants. Utah County’s expanding valley trail system and bicycle lane, with Provo at is core, is becoming a model for the state and beyond. The Provo Bicycle Committee’s record of making advocacy successful and fun was hailed as a success story. 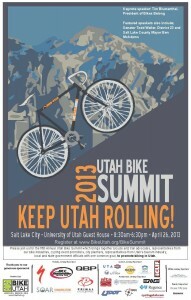 And next year, the summit will be here in our Bronze-Status Bicycle-Friendly Community of Provo. This is indeed a good time to be a bicyclist, and an advocate for bicycling in Utah, especially in Provo. So keep riding and if you are not already please get involved in some way to make our community even more bicycle friendly. Bike Camping: You can do it! It’s summer time! Just think of the biking activities that you can do. If you haven’t tried bike camping before, this is the year to do it. All you need is your loyal bicycle with a sturdy rear and/or front rack and some camping essentials. As always, pack according to your needs and know that it is possible. 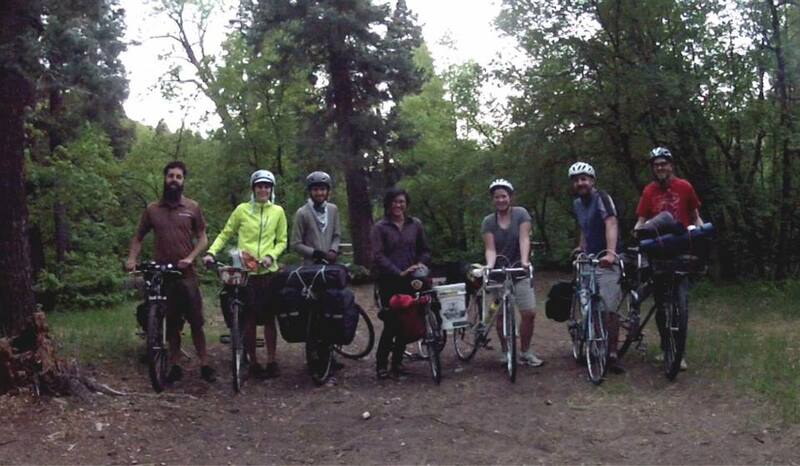 Just check out these savvy bike campers. Ride safe. Enjoy the sun.